Imagine the green rolling hills in the Caldera Highlands above the Boquete Valley. 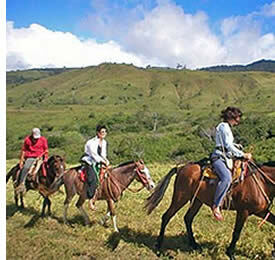 The whole surroundings of the area are ideal for horseback riding with great scenery and different nature trails to follow. Along the way you can find out about the history, the wildlife, and capture your experience on camera. Stay with us in Boquete for the World-Class Jazz & Blues on the slopes of The Volcan Baru in 2013. Dance in the tropical surroundings of Boquete's beautiful "Valle Escondido" (the hidden valley). With a capacity of 500 seats, you may wish to book your tickets early and secure your place at this festival. This venue has amazing acoustics and sounds from any seat in the venue, so even if you are up the back you will see and hear all the great instrumentals and vocals. Marvel at the sight of some of the most beautiful and tropical birds of Boquete. There are 972 different species of bird that can be found in Panama. Most of these birds you will not be able to find anywhere else in the world, which makes Boquete one of the best places to come bird watching in the world. Full of a rich history, the area of Boquete has amazing beauty and many landmarks to see and visit whilst travelling through Central America and Panama. There is an amazing diverse culture surrounding Boquete with lots of fun activities for couples, families and travellers exploring the Boquete landscape. 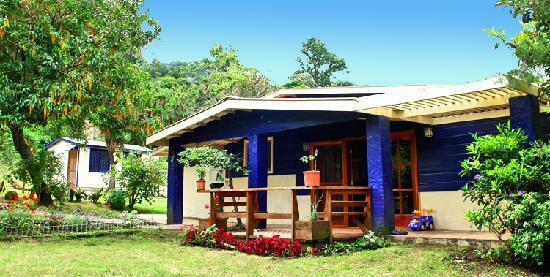 The lifestyle surrounding Boquete is an experience to gain when staying in hostels in Panama. It has been adapted to suit a peaceful way of life, perfect for everyone. The population of Boquete is around 15,000 people, all of which are very welcoming and whose cultural roots go back to native Indians, Spaniards, Europeans, and North Americans from many years ago. We all get excited about going on holiday and rightly so! It isn’t often we really allow ourselves to relax and indulge without feeling guilty, there’s always washing to be done, work to be done and those annoying diets we are trying so hard to stay dedicated to. So when we decide to go on holiday we want to do it properly, we want to lie in the sun, see the sights we don’t usually have time for and scoff some really tasty food. We are a family run business providing cheap accommodation in Boquete. We offer rooms to groups, travellers, families and couples who wish to come and stay with us in our bed and breakfast. We try to make your stay as comfortable as possible, providing you with everything you need for your stay including meals, information on activities or even a baby sitter for the evening. Panama is best known for the amazing coffee produced. The taste is exquisite and the coffee made is second to none. If you are a keen coffee lover, or even if you’re not, you will be eager to take some of this coffee back with you for all your friends and family when you leave! Get hands on experience at the Boquete Coffee Tour at Finca Dos Jefes. Finca Dos Jefes is an organic coffee farm located in the El Salto region of Boquete, Panama. The farm is located on the road to Vulcan Baru at 1400 meters above sea level. On the coffee tour, you can see how coffee is made and help to roast the beans and taste it at the end. It is an amazing experience for any age group to go on, and a lovely day out for the whole family. The Volcán Barú is also known as the Volcán de Chiriqui in Boquete, Panama. This volcano is the tallest in Panama reaching a height of 3,747 metres. Situated in the western province of Chiriqui, the volcano is surrounded by picturesque views of mountains and valleys. Currently the volcano is dormant, allowing for great hiking trips up and down the volcano to discover the beautiful views of Boquete in Panama. Planned hiking tours take many travellers safely up and down the volcano over the course of either a day or a couple of days depending on the type of trip you are looking to go on. This volcano has become one of the most visited places for people travelling through Boquete. The top of the volcano is the only known place where both the Pacific and the Atlantic oceans can be seen at the same time, making the peak of the mountain a golden site opportunity to include on a trip to Boquete. Although there are a minority of people that frown at the idea of retirement fearing that it means they are old, the majority of people in the world have found that retirement provides an opportunity to embrace life and explore the world. When you have worked hard and sacrificed for decades and seen how the economic climate of your native country (or place of residence) had fluctuated, you may now be considering where it is best for you to spend your retirement as this is the time in your life that is meant to be a little less stressful and a lot more enjoyable. Just because you are retiring does not mean that you are expected to stay at home knitting or gardening; for many this is an opportunity to travel or re-locate to a nice hot country that can offer a more desirable lifestyle. Information on Boquete, Panama: What there is to know? Boquete is a small town in the western highlands of Panama in the province of Chiriqui on the Caldera River. Surrounded by green land and mountains, Boquete has become a popular destination for bird watchers, travellers and adventurous activities, being a paradise to be in for many people who visit this destination. Boquete Hostal - Boquete Lodging - Boquete Bed and Breakfast - Boquete Accommodation - Boquete Travel - Boquete Hostel | We are a hostel and more.